We are pleased to share "Nurse Wendy" from The Special Occasions Collection by Madame Alexander. This is a 8-inch bent-knee Wendy with blue eyes and short, side-parted taffy tan curly hair. This littel Angel of Mercy is dressed in a classic nurse's uniform featuring pin tucks, long sleeves with cuffs, and a straigh skirt with a side opening. 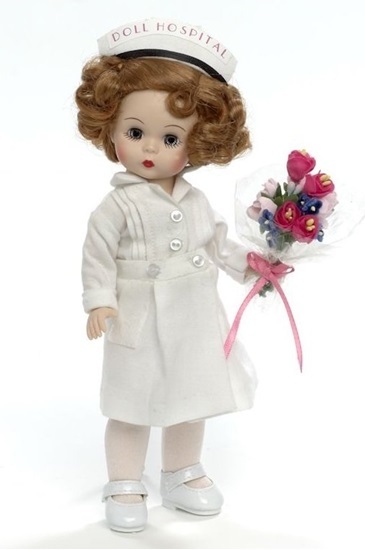 Her cap has a black ribbon and the words "Doll Hospital" embroidered across the front in pink. White tights, white Mary Janes, and a bouquet of multi-toned, pink cellophane wrapped roses completes this darling ensemble.